snips snippets: Second quarter FAL final report! Number one on my list was my sister's Liberty Kaleidoscope pillow. 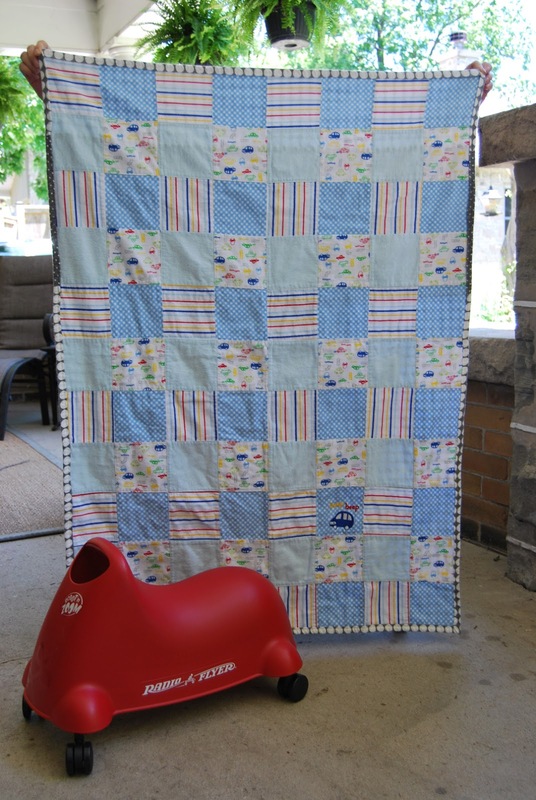 Number five on my list was the My Happy Nursery quilt i gave away for Sew Mama Sew Giveaway Day. Number eight on the list... Ships Stars and Pirate Arrghs! And number twelve my Lizzy House Constellations quilt, Starry Nights. Number two on the list was my Mom's Road to Tennessee. This one is all set to get quilted, i'm just worried about wrecking it. My mom has requested double batting and a flannel backing. Gulp. I've 505'd the heck out of it, between all layers and will have my fingers crossed the whole time i quilt. Number three was Max's + quilt... i've since disassembled the snadwich ( haha snadwich... i mean sandwich) and given it a good press. And left it. How is it possible that i've gone backwards? Sheesh. I haven't taken any new pics so here's the before shot. My Tula Pink picnic quilt... this one was to be finished for my birthday in April. Oops. It's still sitting half quilted at my parents house where i've been quilting it on my mom's machine. Numbers seven, nine and ten are being disassembled. I didn't really like any of them from the start and i just can't justify spending time on projects i don't like. Fabrics will be put back into stash to be used at a later date! And lastly, my Come What May quilt, no progress to report on this one at all... though i did fix that bottom row where all the blocks seem to have turned the wrong way. It's sandwiched and waiting to be quilted. So four finishes out of twelve isn't that bad. I would have like to have gotten my Mom's and Max's quilt's finished, but there's always the third quarter! And i'm thinking the list for that one is going to be much, much longer. But in my defense i did manage to get all this done in the last three months! Ten quilts in three months isn't all that bad! I also manged to knock these out as well. My bee blocks through September. Lego Star Wars pattern testing for Kristy at Quiet Play... i'm counting these as finished, faces are overrated. (C3PO is now finished, i just haven't taken his mug shot yet), and don't worry i will put faces on them... eventually. Finished up some paper pieced stars for my Christmas quilt. And my Tula Pink City Sampler blocks. Wow, now that i've compiled all these i'm not feeling so bad about not getting my list finished. In addition to those, i also made three Oliver and S bucket hats, and made what i think is a great start on a shirt for Max... that may or may not ever get finished. I also started these three quilts. 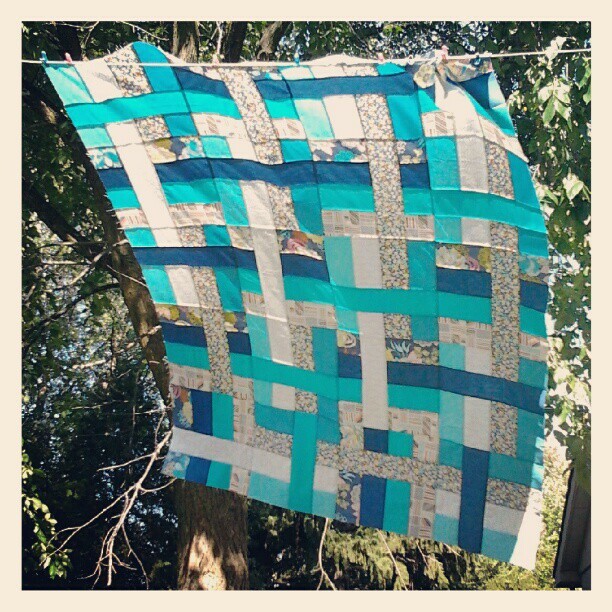 And this lovely little number... that still has absolutely no direction, and could possible end up being two quilts. And finally my finish for this week. The second block of my AMH hexie quilt is done! A full 12 inch block of hexies. This is what the quilt consists of so far. The bottom right is my next hexie block, just debating on if i should go all colourful hexies or just pink and yellow. I'm leaning to the pink and yellow, what do you think? Wow, long post... sorry about that! 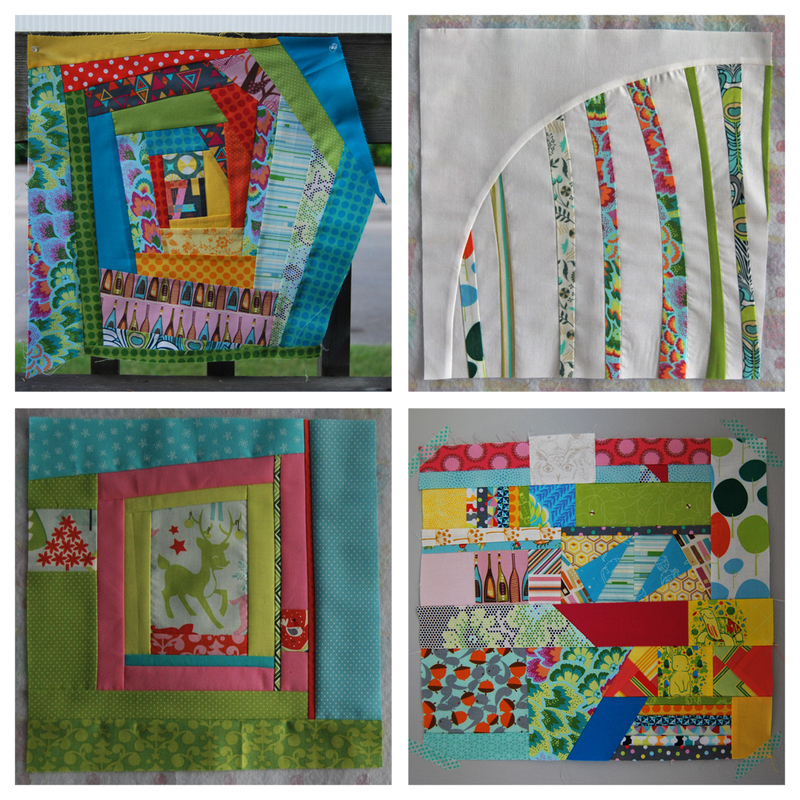 Linking up with the Friday Finishers over at Crazy Mom Quilt's! And another over at Kelly's for Needle and Thread Thursday! Make sure you check out all the awesomeness happening! And also pop over to Leanne's to see the rest of the FAL finishes! Some fantastic finishes over there! No high fives today... i have a cold and don't want to spread my nasty germs. Geez look at all this eye candy! You make a lot of lovely stuff! On the RtT quilt--make sure you test out your quilting/tension on a scrap quilt that also has double batting and flannel backing! Love all your feathers and hexies! Wow!! that's quite the impressive list! Finished or not, you have some awesome projects going on! You're keeping your quilt gnomes busy, haha! I'm so glad you linked up to Needle and Thread Thursday! That's pretty amazing. I think that would be a lifetime of work for me! Love the finishes and looking forward to seeing the others come together. Ok, that was a ton of eye candy!! You are amazing and have been plugging away making all kinds of progress!! Can't you use the nursery Versery blocks you didn't care for on the back of the gray and yellow blocks you are working on? Can't imagine taking those blocks apart!! Happy weekend to you Nicole!! That is an impressive list of projects! Why not finish off the quilts you're not so happy with and donate to charity? HOLY SMOKES! Wow wow wow. I'd say you've been q-u-i-t-e productive here, lady! That Indian Summer creation is going to be stunning, I can tell (AMH feathers... drool!) And I love that quarter circle block with the strings of color -- what's that one for? ?